Transcranial Direct Current Stimulation (tDCS) is a noninvasive procedure (meaning it does not enter the body) that uses weak electrical currents applied to the head in order to enhance brain activity. tDCS has recently been used more and more as a tool for neuroscience research, and for the assessment and treatment of various disorders. tDCS has the distinct advantage of being inexpensive, easy to administer, noninvasive and painless. Recent studies support a therapeutic potential of tDCS in patients with chronic neuropathic pain, Parkinsonism, stroke recovery, tinnitus (ringing in the ears), traumatic spinal cord injury, depression and other illnesses. tDCS has not been approved by the FDA for any therapeutic applications, thus treatments are considered an "off-label" application. What does tDCS feel like? 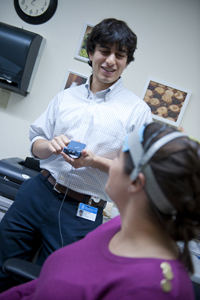 During a treatment session, the tDCS machine uses a small electric current that uses the energy of 9-volt batteries to stimulate a patient's brain. (For the sake of comparison, a 9-volt battery is typically used for home fire alarms). Electrodes (small sponges soaked in salt water) are placed over certain parts of the head. The electrodes are held in place using a rubber headband. The direct current flows through the electrodes, penetrating a patient's scalp, and creating a flow of electrical current in the brain. Usually patients feel a slight itching or tingling on their scalp.